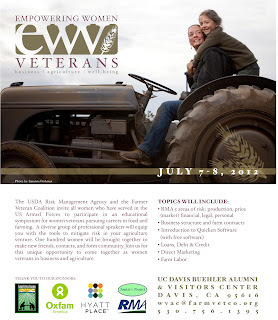 Seminar on Organic Production in Northern California! You are invited to join OFAC & NorCal CAPCA Chapter at the upcoming organic production seminar. TIME: 8:00 a.m. to 4:15 p.m.
Pre-registration deadline for this event is July 5, 2012. If you have not yet registered, please register on-line today! Webinar on Crop Insurance for diversified farms, tomorrow! The National Center for Appropriate Technology (NCAT) will offer a webinar on Thursday, June 28, to explain Adjusted Gross Revenue Lite (AGR-Lite)— a unique federally subsided crop-insurance product that holds great promise to serve the needs of smaller, diverse, specialty crop, organic, and direct-market farmers. Crop insurance agents, agricultural lenders, and cooperative extension agents from the Southeastern states are especially encouraged to attend this June 28 webinar, which will be tailored to their needs. The webinar will feature regionally-appropriate examples from the Southeast, and there will be ample time for attendees to ask questions about both AGR-Lite and the AGR-Lite Wizard. While most insurance products are tied to a specific crop or commodity, AGR-Lite is based on whole-farm revenue, and allows farmers who grow several specialty crops, or diverse crops and livestock products, to insure their production based on their historic revenue. The webinar, "AGR-Lite—Understanding Whole-Farm Insurance for the Specialized and Diversified Farm," will explain how AGR-Lite works, provide a brief overview of crop-insurance limitations for specialized and highly diverse farms, and will also demonstrate NCAT’s new AGR-Lite Wizard assessment tool. This tool assists farmers and agricultural professionals in evaluating the usefulness of whole-farm revenue insurance. Jeff Schahczenski, an NCAT Agricultural Economist, will be the webinar presenter. The webinar will begin at 1 p.m. Eastern Daylight Time on Thursday, June 28, 2012. It is funded by the USDA Risk Management Agency. Thank you to everyone who took action today! The Brown Amendment #2445 just PASSED 55-44! This is great news for beginning farmer programs like FarmLink and those that depend on them! Please join us for a two-day event about combining pastured poultry with cropping operations. Thursday, June 28, is a workshop as outlined below. Friday, June 29, is a tour to nearby farms that successfully combine pastured poultry and other crops or livestock. Who should attend this event? Farmers who are considering a pastured poultry enterprise. Farmers with pastured poultry operations who would like to learn more. People who are interested in starting to farm. Cost: $20 to cover both days. Thanks to a grant from the USDA Risk Management Agency, NCAT is able to offer these workshops without charge to participants except for the cost of lunches. Presented by: National Center for Appropriate Technology (NCAT) and ATTRA—the National Sustainable Agriculture Information Service, with funding from the USDA Risk Management Agency (RMA). Workshop capacity is 30 participants. Because we will cover a great deal of information in this workshop and will travel by charter bus for the farm tours, we appreciate your commitment to participate both days whenever possible. To register and provide payment information, visit www.ncat.org and click on EVENTS at the top of the page. You can help us tailor this workshop to your needs by sending an email to annb@ncat.org briefly describing any specific questions or challenges in your operation that you hope to address. This is the third of five regional pastured poultry and crop production workshops and farm tours offered by NCAT in 2012. North Coast and Southern California workshops will be held later this summer. Dates and locations will be announced soon. Urban Cultivators is a backyard conservation initiative for the Sacramento Hispanic community. The initiative is supported by USDA’s Natural Resources Conservation Service (NRCS)* and coordinated by Carmen Fisher with the NRCS Sacramento County office in Elk Grove. With a growing local urban community, the Elk Grove office will continue to support farmers and their work, but we must look toward the future of backyard conservation. Elk Grove sees Urban Cultivators as the next step in educating the greater public on the social and environmental benefits of creating a healthy neighborhood through conservation. With this initiative, we are promoting urban gardens and greenhouses to encourage proactive community contribution and participation. Urban gardening is about using space wisely to regain a closer connection with food and beautify the neighborhood. Investment in urban gardens and similar practices also creates opportunities for agricultural education and workshops to encourage conservation and healthy living with greater access to fresh and nutritious fruits and vegetables. Urban Cultivators will evaluate current conservation efforts and tailor backyard conservation to meet the needs of the Hispanic community. With the help of community organizers, we will build relationships to expand and strengthen the local Hispanic farming movement. We hope to help Hispanic urban gardening groups eventually own and operate their own land with conservation practices as a priority and produce enough food to sell at the community’s own farmers’ market. If you are a grower that is interested in creating urban farming opportunities in the Sacramento Hispanic community, please contact Carmen with the Natural Resources Conservation Service, Carmen.Fisher@ca.usda.gov. Riverhill Farm is a CCOF-certified organic farm in the foothills of the Sierra Nevada Mountains in California, near Nevada City. Nevada City is a small town with a vibrant farm community and great Farmers' Market at 2500' elevation. We are cultivating more than ten acres this season, and our season runs from June to November. For more information about our farm, see our website at www.riverhillfarm.com or find us on Facebook, where you can see recent photos of the farm. We have an immediate opening for an experienced field worker. Must have at least one full season on a diversified vegetable farm, be hard working and clear about your commitment to working a full season on a farm. The work week is forty hours with an occasional Saturday Farmers' Market. Housing may be provided. To apply, submit a resume, cover letter and at least two farm-related references by email to alan@riverhillfarm.com. A farm visit and interview is required. The University of California's small farm program and the California Department of Food and Agriculture (CDFA) Division of Fairs and Expositions are teaming up to connect fruit, vegetable, nut and flower farmers with county and regional fairs to celebrate California specialty crops. Together they are organizing workshops and tours for farmers and agricultural leaders at seven different fairs throughout the state, to be held during the 2012 fair season. For registration and more information about these events, visit http://sfp.ucdavis.edu/events/12fairs or call Penny Leff at (530) 752-7779.
funding for rural development and beginning and socially disadvantaged farmer programs. How could these important programs get left behind? invests in the next generation of farmers? 2012 Farm Bill, so they need to hear from you TODAY. Slow Food Sacramento's 4th Annual Urban Ag Fest Eat! Learn! Enjoy! Interested in volunteering at this event? Sacramento County ID #1410: 5-8 acres available for organic farm. 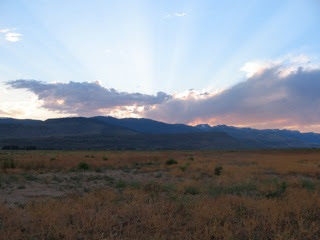 Two adjacent five acre lots, formerly a horse business up until January 2012, available for organic production. One five acre plot has it's own well and sprinkler system. The second five acre plot shares a well with property owner and has a barn that is available for some storage and has a bathroom. Lassen County ID #1409: 80 acre property for lease with option to purchase This property is off the grid, and sits on the boarder of California and Nevada on route 447 in Surprise Valley, California. Property features an 80 gpm ag well, stock pond, good soil and a 3,000 square foot steel barn. The land is fenced with but repair work is needed on the north side of the property. There is cell phone reception if you have Verizon or a satellite phone. Owners require organic production methods.